Holes : 9. Length : 1968mts. Par : 27. 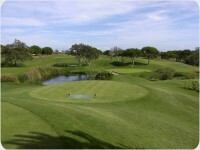 Features : A testing par 3 golf course with a nice clubhouse and in a beautiful situation for your short game work out. Facilities : Resident professional, academy, 40 bay driving range, 3 putting greens, lockers, club hire, trolleys. Required : Handicap Certificate - No. Location : On the coast road towards Olhos d'Agua, 2km East of Albufeira. See Map.